Highland Body Shop understands that vehicle accidents are a fact of life, whether it’s a minor fender-bender you have in a traffic jam or an impatient driver who decides to beat a stoplight and seriously damages your vehicle. That’s why we are happy to provide expert auto body collision repair for local residents who want their vehicles repaired and returned in better shape than before and in a timely manner. 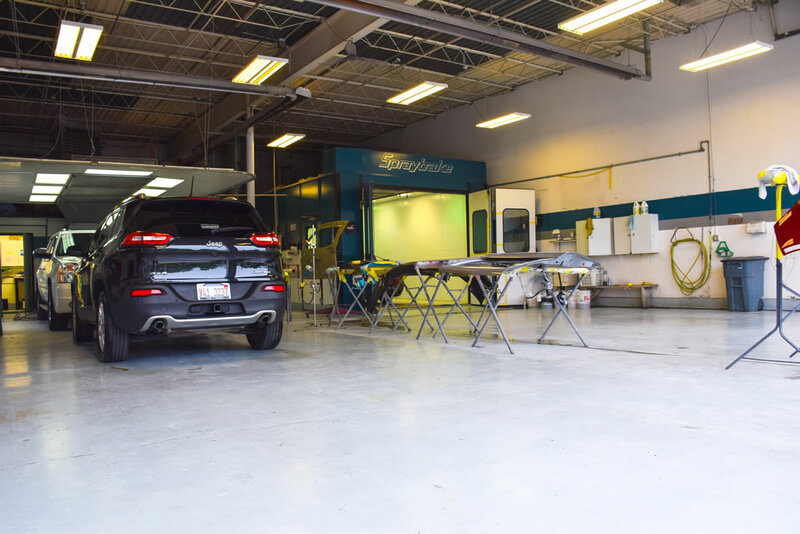 Using cutting-edge technology and PPG Envirobase refinishing processes, Highland Body Shop technicians give our customers’ vehicles the same flawless finish found on vehicles coming right off the assembly line. In addition, all our vehicle paint and body work is backed by a limited lifetime warranty. We carry equipment necessary for repairing badly damaged vehicles to their original factory condition, such as laser measuring systems that provide our technicians with precise specifications essential for restoring structural integrity to frames and underbodies. Highland Body Shop is certified to meet or exceed Auto Manufacturer standards stipulating the use of specialized equipment, training and customer care services. Sometimes minor dents and dings can be repaired without requiring paint work. Paintless dent repair is a cost effective method of eliminating minor damage that we recommend whenever possible. If your vehicle needs its windshield or door windows replaced, we will arrange to have a local auto glass specialist come to our facility and replace broken or cracked glass with new glass. We also specialize in affordable repairs of all types of interior damage, from cracked panels to cigarette scorches to broken electric seats. Highland Body techs can also replace extremely damaged or worn interior upholstery with brand new, fresh-smelling upholstery. Call and ask about our after hours drop-off service so we can get started on repairing your car as soon as possible. Need a Vehicle to Drive While Yours Is Getting Repaired? We can make arrangements for a local Enterprise or Hertz car rental company to pick you up at our office. Highland Body Shop always offers free estimates, regardless of the amount or severity of damage done to your vehicle. No appointment is necessary. If you’ve had an accident, don’t stress any longer about getting your car restored to its previous condition. Bring it to us and we’ll be happy to get you back on the road as quickly as possible.